The lawn is the mainstay of many gardens and suffers a lot of wear and tear in summer. The smaller the garden, the harder it needs to work. As autumn starts, now is the time to offer it some TLC. Grass grows fast during warm and damp weather and here I need to keep cutting the grass well into October when colder weather starts. That is the first step to improving the lawn and while mine will never be as smooth as a croquet lawn, I would like it to look a bit more like one of these and a bit less like a field. Croquet lawn Belsay Hall and Gardens. David Dixon. Licensed for re-use under Creative Commons Licence Attribution-ShareAlike-2. The RHS advice notes are a great resource and there are helpful pictures of what to do at Sun Gardening‘s step-by-step autumn lawn care project. A good place to sit down afterwards. After you cut it, rake it. This scratches out moss and old, dead grass and creeping weeds and grasses that create a springy feel and what is known as ‘thatch’. It is hard work. Forget the gym, this is better for your garden and your abs. The technical term for this is ‘scarifying’. You need: a long flexible, wire toothed rake (a spring-tined rake) or a powered lawn rake (yes, there are such things). Rake firmly, holding your tummy in, and pulling out moss and grass as you go. It will look a mess to start with and you may end up with bare patches but grass recovers fast and next year the lawn will be stronger and better looking, and think of it as the garden gym. Simple enough – after you have raked it, mow it with the box on the mower, but if you usually mow top to bottom change to mow side to side. This picks up material you raked out but didn’t rake up. It is a good idea to change directions during the year too – but let’s worry about that next year. Lots of wear and tear packs the soil and grass down hard, rainwater cannot run away easily, which encourages moss and algae. That can be slippery in winter, and not nice to look at or sit on next year. You need: a good garden fork or a special lawn aerator. Press the fork down into the grass 8-10 cm (3-4 inches) every 10-15 cm (4-6 inches) across the lawn. I walk steadily up and down pushing the fork into the ground at each step. Count your steps to keep you motivated! Autumn feeding is different from spring feeding. 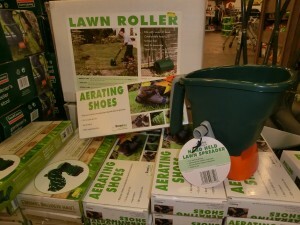 Now you don’t want the grass to grow fast (as you do in spring) but want to strengthen it for next year. So you need a different sort of feed. I used to think I could feed my lawn neatly and evenly – but a consistent cover across my lawn beats me. So I invested in a hand-held roller applicator. It is worth it, even for a small lawn. Share one with the neighbours? How about some running repairs?